Session 2 of Real Estate Web Strategy Success takes place this coming Friday, March 23rd, and focuses on the topic of "The Fundamentals of your Web Container." What everyone calls Websites I call 'Web Containers' in order to convey to Real Estate Brokers and Agents the message that the tools and ingredients that are integrated within your container will either build your long term visibility or will make it nonexistent. 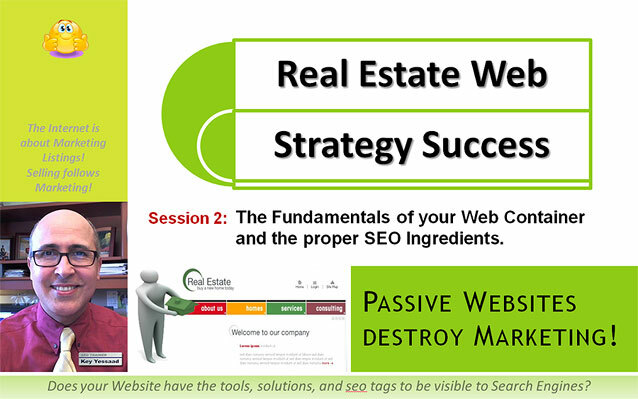 The 4-session series, Real Estate Web Strategy Success, takes into account the commitment of Brokers and Agents to succeeding on the internet, and empowers them to layer their business with a deep understanding of Internet marketing, SEO, High Search Engine Visibility, and Social Media Integration. What are the ingredients of Real Estate Websites? How is IDX best integrated in your Website? Framing Data vs Not Framing? How about iFraming? What are the tools of Lead Capture and delayed registration? How does one integrate Keywords strategically? Listing Enhancement Tools and Seller Visibility. What are some examples of visible websites? The Web Grinder and Homework. Internet Marketing, Web Strategies, Google Presence, and how to use your website to generate leads organically. The core of Search Engine Optimization (SEO), or Organic Placement, are now the bedrock of your growing Marketing Success Story. This course was designed to be practical, solutions-driven, and full of practical Homework. This is not about theory – this is about meeting your clients online and being able to generate your own leads organically – and the best ones are Listing Leads. Do you have a proper Internet Presence? System: Live Interactive – Contact Live Interactive at (407) 331-5738. If you happen to be on their System already I hope to visit with you soon – Get ready to not only learn the fundamentals of Internet Success, but to also roll up your Sleeves and implement the ideas learned to affect your Real Estate Success.